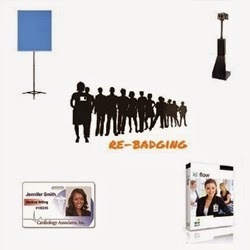 Whether your company is in the process of re-badging for the purposes of facility security, event management or accounting of personnel, at eXpress badging we offer you the capability of outsourcing your badging needs directly or handling it yourself in-house. For those preferring to do the job themselves, we offer all the required equipment, supplies and support assistance you'll need to get the job done and to get it done right. If it's been some years since your company's employees have received new badges and the re-badging task has fallen to you, you want to ensure that you have everything in place to complete the task professionally and within the expected time parameters. For many of our clients, that means employing the use of the Jolly ID Flow Professional Photo Capture Kit. This system consists of what you need to easily capture images of your personnel and to crop and adjust those images using the premium software included. The Jolly ID Flow Photo Capture Kit includes a high-quality web cam that sits atop a tabletop pedestal for easy focusing. The pedestal has a built-in gooseneck for maximum flexibility, takes up very little surface space with its small footprint and is well weighted to prevent it from falling over. This camera is the professional choice, designed specifically for use in producing high-quality ID system photos without requiring the use of a flash. A built-in CCD senor allows for optimum picture quality and it can even provide you with a still image caught from video. It comes with a USB extension cable. The Jolly ID Flow Photo Capture Kit includes a quality photo backdrop on a portable stand to allow for consistency in all your photos and to remove the nuisance of ID photo glare. These nylon (micro-suede) backdrops are available in a choice of six colors including: red, yellow, green, white, dark and light blue. This is all orchestrated by the use of Jolly's Premier Badging Software, a highly advanced, networkable ID Card solution for companies with multiple locations, centralized data and strict security needs. This #1 selling software allows for the production of professionally created ID credentials utilizing complex data integration, including access control. The Jolly ID Flow Photo Capture Kit, sold here at a deep discount from suggested retail, saves considerably more money than if you were to purchase each item separately. This is a great package deal from eXpress badging.